Imagine sitting in your tree stand on opening morning. As the first rays of sunlight start shining through the autumn leaves, you hear a branch break. Just as you imagined, you spot a deer walking down the well-used trail you found earlier in the week. It’s a brand new stand site and the deer should have no clue you’re there. But as soon as it enters a slight clearing, its head shoots up and aims right at you. You didn’t make any noise and the wind is in your favor. But still, the deer turns and disappears faster than you can do anything to stop it. All because you didn’t take time to hide your tree stand with tree stand blinds. If you’ve hunted long enough, you’ve probably had an experience like this. Whitetails are remarkable at spotting differences in their environment. Their eyes are amazingly adapted at finding things that stick out from their surroundings; a new tree stand, for example. In order to beat this amazing sense of theirs, you have to take a little more care to hide your tree stand when you hang a new stand. This often includes installing tree stand blinds. 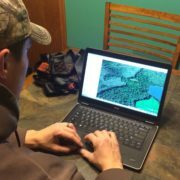 If you’re hunting unpressured private land deer, you can probably get away with less. But the steps below are almost a requirement for public land hunting these days. It’s no doubt that ground blinds can be much more easily hidden than tree stands. They are low to the ground and can be covered with all manner of camouflage patterns and branches. But they can be more difficult to hunt deer out of sometimes. You don’t have the height advantage on your side, for one thing, which inhibits your prey detection and prevents any longer shots. But there are some things you can do with tree stand concealment to hide it just as effectively as a ground blind. One of the first tips if you’re using a really old stand is to either get a new one or freshen it up. If there aren’t any safety concerns, then painting a tree stand or just installing tree stand blinds could do the trick to help it blend in better. Grab a couple cans of spray paint, in black and various shades of brown, green, and yellow. Next, collect some natural materials (e.g., grasses, weeds, branches, leaves, etc.) from the area you’re going to hunt. Spray a light background color, such as sage green, all over your stand. Then either sparsely lay some of the natural materials on top of the stand, or tie them down with some twine. Once they’re tight against the metal frame, spray a mustard yellow or brown paint over the top. Add some more materials over the top of these, and lightly spray a black color over what’s left. You can experiment with the colors and which sequence you spray them in, but focus on colors that match the season you’re hunting in. In other words, no bright green colors if you’ll be hunting in late autumn. You can quickly camouflage a deer stand with a couple cans of paint and a few hours. One of the best deer stand concealment steps you can take is to simply take advantage of the natural cover around you. There are no synthetic materials that can beat the natural vegetation in an area in terms of camouflage value offered. That being said, some trees are better suited to hanging a new stand than others. For example, trees with multiple trunks or lots of branches work great since they offer so much natural camouflage and structure that you can hide in. Pines, cedars, and oaks come to mind as excellent choices since they generally have a dense branch structure and maintain their needles or leaves through most of the hunting season or year-round. These trees are excellent choices for hang on stands, since you can tuck them right into the branches. With a good set of camouflage clothing, you should stay pretty hidden. Deciduous trees with bare trunks (e.g., aspens, maples, birch, etc.) are great for ladder stands, but you tend to stick out like a sore thumb without any ladder stand concealment. If you must hunt from a tree such as this, you should definitely use a tree stand blind kit or camouflage burlap. Wrapping the seat and platform of a ladder stand is a great way to at least hide your movements while in the tree. Using fabric with loose-cut leaves is even better since it adds a natural look and motion. These tree stand blinds are simple to carry with you while hanging stands, and do so much to hide your profile. Simply drape the fabric or ladder stand blind kit around the shooting rail and use twine or zip ties to secure it thoroughly. Leave a slit opening at the front so you can climb into the stand with all your bulky hunting clothing and gear. There’s nothing worse than trying to quietly slither through a narrow gap on opening morning, realizing that a knife is the only way you’re going to get into your stand. While this definitely helps hide your movement from keen eyes, a large bulky shape in the sky among a bunch of bare trunks still sticks out to deer. Another way to really hide your tree stand involves a more three dimensional application. Real or fake branches are excellent to blend into the surrounding area. Using tree stand concealment branches can be done in two ways. The first is to collect some actual branches from near your stand, preferably live ones with leaves still on them for deciduous trees (oaks tend to hold onto their leaves longer than many others), or coniferous branches for a coniferous tree. The other is to stock up on fake Christmas tree branches when they go on sale at the end of the year. Obviously, these are more useful for coniferous trees. Either way, attach the branches to your stand with twine or zip ties, spreading them out evenly to hide your profile. You want enough branches so that it looks natural and blends in, but not so many that it sticks out (when’s the last time you saw a ball of branches extending every direction 20 feet up a tree?). And you definitely want to make sure to leave yourself ample shooting lanes for close-range bow shots. Too often, we don’t know when to stop and suddenly realize we can’t see the ground from a sitting position. The final way to really hide your tree stand is not so much a mechanical add-on or fancy camouflage system of tree stand blinds. It simply involves hanging your tree stand higher. Climbing stands and lock-on stands makes this is easily doable. Well-educated public land deer have come to expect to see hunters at the typical 10 to 15 foot range off the ground. So if you can sneak up a little higher, say 20-25 feet, you’ll be further out of their peripheral vision. If you go much higher than that, your shot angle can be too severe to get a double lung pass-through. Make sure to stay safe while hunting higher and always use a hunting safety harness. And of course, pay attention to your state hunting regulations as some states have maximum allowable tree stand heights. While you’re out deer scouting this summer, pay attention to the surrounding trees and think of ways that you could hide your tree stand better. Using all of the steps above whether it is natural cover or tree stand blinds, it should leave you pretty invisible to all but the wisest whitetails. You’ll need a little luck on your side to get close to them.